Bookings from residents and local community groups are now being taken for the hire of Hailsham’s brand new community hall – the James West Community Centre – which is located off Brunel Drive in the north of the town and opened its doors to the public on Monday [25 June]. 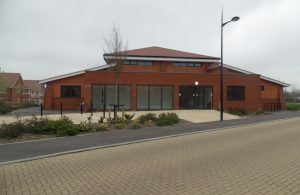 The James West Centre, named after the founder and Chairman of the Hailsham & District Sports Alliance who passed away in November 2016, consists of an 18m x 11.7m hall, able to accommodate an audience of around 200 seated for licensed public performances. The Town Council, which agreed to take on responsibility of the new James West Community Centre, considered various proposals for the design of the building in 2013 and formally agreed a design plan which will allow the Council to accommodate a wider variety of users and to provide improved facilities which help meet the demands of the local sports clubs and community groups. An official opening ceremony will take place later this year and construction of a separate website for the Centre will commence soon.